Photo: Hunter House, ca. 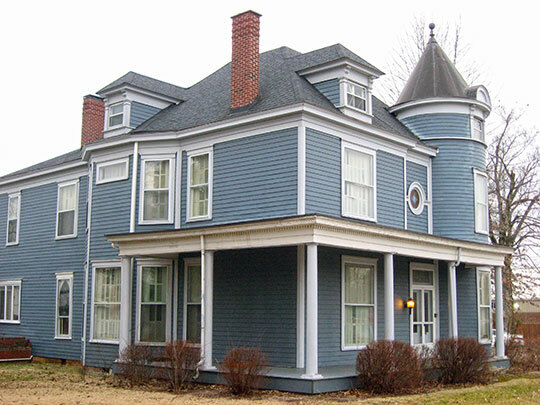 1886, 118 West Walnut Street, Leitchfield, KY. Listed on the National Register of Historic Places in 1985. Photographed by User:Nyttend (own work), 2014, [cc0-by-1.0 (creativecommons.org/publicdomain/zero/1.0/deed.en], via Wikimedia Commons, accessed August, 2015. The Grayson County Courthouse is located at 10 Public Square, Leitchfield, KY 42754; phone: 270-259-3201. Prior to settlement, land that is now Grayson County was home to thriving herds of buffalo, deer and elk. Dense forests and numerous streams in the area provided sources of abundant food, water and building materials that attracted settlers to the area. Grayson County was settled in the late 1700's. George Washington was among the early landowners; he purchased 5,000 acres on the southern shore of the Rough River in 1788. As more people settled in the area, Grayson County was established in 1810 with land taken from western Hardin County and eastern Ohio County. The County was named in honor of Colonel William Grayson, an aide to General Washington. Grayson was a revolutionary soldier and Virginia statesman. Leitchfield was incorporated as the county seat of Grayson County, by the Kentucky State Assembly in 1866. City of Leitchfield, Kentucky Planning Commission, Comprehensive Plan, 2015, www.leitchfield.ky.gov, accessed August, 2015.